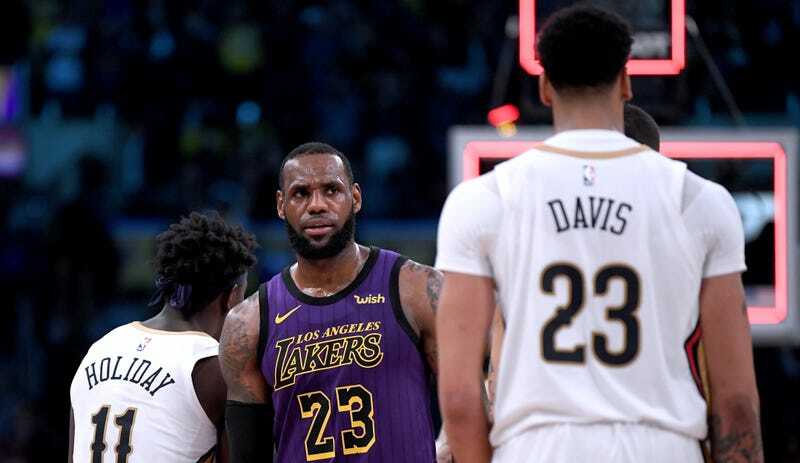 The escalating non-story of LeBron James making moves on Anthony Davis finally ensnared the NBA league office on Friday, with league counsel reportedly reminding teams via a carefully worded memo that only great big meanies would ever honestly answer a question about whether it is good to have good things. To recap: ESPN’s foremost scoopster speculated about the Lakers’ future roster plans; an ESPN reporter then used that analysis to produce a quote from LeBron James about whether he would enjoy playing with Anthony Davis; another ESPN reporter spun that up into an analysis of the prospects of Davis being traded to the Lakers; next the ESPN scoopster went out and riled up a handful of competing general managers to hammer LeBron’s quote into a tampering story; then ESPN’s foremost basketblogger described this “trade talk” as “the biggest story in the NBA,” as if, you know, there isn’t actual basketball going on. Meanwhile, nothing of any substance whatsoever has been learned or reported about trade proposals, or free agency intentions, or desired destinations, or deadline plans, or anything at all. Ah ha. So weeks of ESPN making grim meals out of its own excrement have produced a memo wherein the NBA sternly warns teams that it will not hesitate to hand out punishment the very moment players’ public comments escalate into the balcony scene from Cyrano de Bergerac. And since what started all this cannot honestly be described as recruitment, and since no one will ever prove in a million years that LeBron requires or solicits or accepts or in any other way utilizes the input of his bosses before giving the only honest answer to the world’s most obvious question, surely we can all drop this now, once and for all. ONCE AND FOR ALL, I SAID.